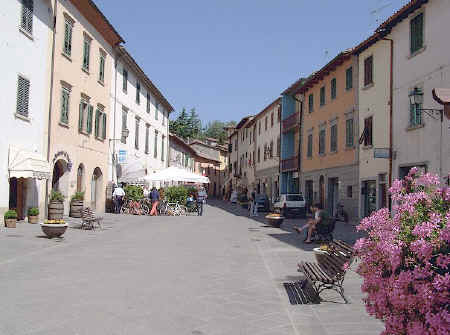 Tourist information on Gaiole in Chianti and the surrounding areas of Tuscany. Gaiole in Chianti is a municipal territory in Tuscany, Italy, that extends for 129 square km between the hill country of Chianti and the hills of the Val d’Arbia. It had its origins in mediaeval times as the market for the Castles of Vertine and Barbischio, and became the seat of a comune with the Leopoldian reforms in 1774. The first mention of the Gaiole territory comes from 1086 in an act of donation from the nearby Abbey of Coltibuono. 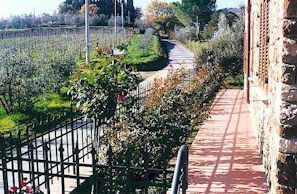 However, it was only at the end of the 12 C that the village of Gaiole began to develop on the road which runs from Valdarno to Chianti, as a place of exchange for the nearby castles, and it was recorded in a document dated 1215 as a market. With the foundation of the Chianti League by Florence in the middle of the 13 C, Gaiole was affirmed as capital of one of the Terzi "Thirds" (the others were Castellina in Chianti and Radda in Chianti), representing an important military base for Florence, from the middle of the 1400s until the Florentine conquest of the territory of Sienna. In the territory of Gaiole there are still imposing castles of extremely ancient origin: Castello Brolio, owned by the Firidolfi-Ricasoli family since 1172 and completely reconstructed in 1564; Montegrossoli, conquered by Florence in 1172 and coveted for its strategic position on the crest between Valdarno and Chianti and of which today remain only impressive ruins; Meleto, this was also for a time owned by the Firidolfi; and also the noted Abbey of Coltibuono, one of the most important Vallombrosan centres of the region, founded in the 11 C and in 1810 becoming a privately owned farm. 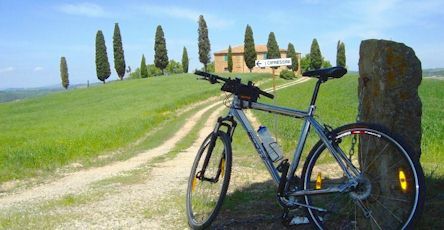 Tuscany e-Bike Rental snc, located in Gaiole in Chianti, rents e-bikes. Podere Capiteto offers vacation apartments for 2 (+1) persons. Our olive farm enjoys fabulous views out over the Arno valley and Florence, and as far as Fiesole and the Apennines. Florence is an easy drive away and central Florence can be reached in 20 minutes by bus. We provide a large swimming pool. This is the perfect place to stay to enjoy cool air in the summer while having easy access to the museums and churches of Florence. More about Podere Capiteto vacation apartments near Florence. Bed & Breakfast High up in the Chianti hills far from the heat! Looking for a rare or used book? 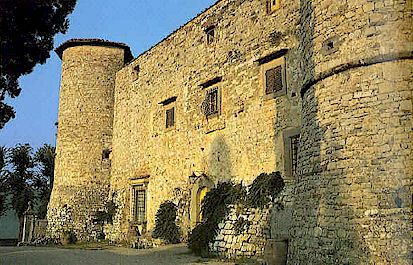 If you are interested in castles - the Chianti Castles route ("La strada dei Castelli del Chianti") provides itineraries for viewing and in many cases visiting the castles, walled abbeys and fortified farm houses in the area around Gaiole. 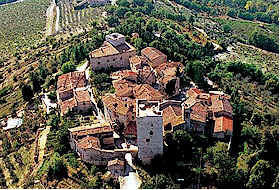 There is also a charming walled village near Greve in Chianti, known as the Castello di Montefioralle. A house said to be the birthplace of Amerigo Vespucci is located there - it definitely belonged to the Vespucci family. possession of the monks of nearby Coltibuono. 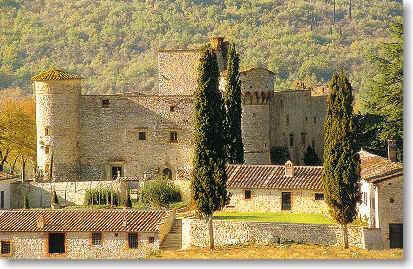 The Castle of Montegrossi, also known as Montegrossoli, was the sentinel and final rampart of the mediaeval Chianti region. 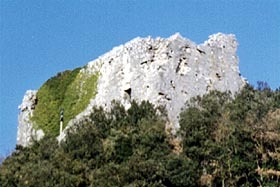 It was constructed at around 700 m on the crest of the last salient of the small mountain range on the border between the territories of the Chianti and the Valdarno. 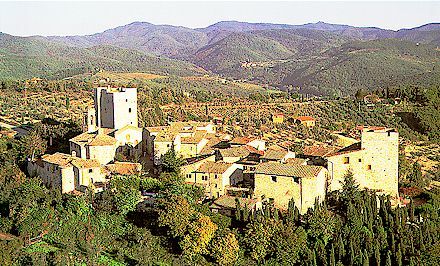 Last but not least, the charming mediaeval village of Vertine rises above Gaiole on a hill at 357 m.
Vorresti pubblicizzare la tua attività su questo sito web per la Gaiole in Chianti e ricevere traffico in entrata dalla nostra rete di più di 50 portali relativi? Clicca qui per ulteriori dettagli in merito alla nostra soluzione integrata per una presenza su internet piena di successi. If you're planning a holiday and looking for a place to stay in Tuscany, click here for everything you need to know about Chianti.